This is a big week for thank-you holidays. Today is National Teacher Appreciation Day and World Red Cross and Red Crescent Day. Sunday is Mother’s Day. For most of us, our moms and our teachers helped shape our childhoods and the “grown-ups” we’ve become. If you follow the news for a roleplaying game company like us, odds are very high you’re more of a reader than most folks, and there’s almost certainly someone who helped guide you that direction. Statistically, it was your mom or a teacher. If nothing else, please thank them on our behalf for helping, in some small way, to lead you to us. For many of us touched by disasters—from flood to famine, tornado to tsunami, earthquake to evacuation—the Red Cross and Red Crescent is one of the first agencies there to help. For 181 years now, they have been working to alleviate suffering, whether by well-reported relief efforts or quiet CPR training and blood drives in your neighborhood. I urge you to take some time this week and say thanks. Whether it was your biological mother, an aunt, or even a neighbor, there’s probably someone who’d love to hear from you. Send a note to your old teacher, or volunteer in a classroom. Help the effort by giving blood or being prepared by taking a CPR or life-guarding course. For our international friends, you most likely have similar holidays. Even if they aren’t celebrated now in your country, especially if you don’t know when they are, I encourage you to join us over the next week in appreciation. Visionary Comics and Pinnacle Entertainment Group are proud to present Deadlands, the critically acclaimed and fan favorite new comic series, in digital distribution. The work of masters such as Jeff Mariotte (Desperados), Brook Turner (Golly! ), Ron Marz (Artifacts), Bart Sears (Conan), Jimmy Palmiotti and Justin Gray (Jonah Hex), Lee Moder (Shinku), David Gallaher, and Steve Ellis (High Moon) brings the Weird Western World of the Role Playing Game to the world of comics with style. 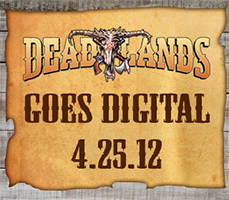 This collaboration of industry all-stars has created four brand new stories that delve deeply into the mystery and mayhem of Deadlands. 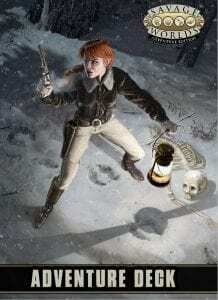 Set in an Old West gone slightly weird, these stories range from the mad invention of The Devil’s Six Gun to the masterful horror of Death Was Silent. We are also excited to bring you, for the first time in one complete issue, The Kid; the backup story that ran through all four print editions of Deadlands collected together under an exclusive new cover. Telling the origin of the fearsome werewolf stalker Billy the Kid, this story sets the stage for the upcoming mini-series. Each Visionary digital exclusive edition will also include a special feature with preview art for The Kid: Death in a Small Town as well as the first teaser image and major announcements about RAVEN! The initial issues are available from the Pinnacle PDF store, DriveThruComics, and Wowio, and have already captured the best-selling title! They are soon to be available on Ave!Comics. The Water’s Risin’ Near You! 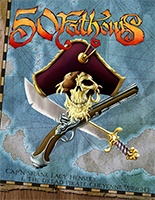 50 Fathoms: Explorer’s Edition began shipping to pre-orders and distributors last week. If you’re one of those lucky folks, you may already be dripping in sea-faring adventure by now! Keep an eye out at your local retailer—I’m sure they’ll be awash in 50 Fathoms soon! If you missed your chance to preorder the fully-updated 6.5″ x 9″ softcover of our classic fantasy pirate setting, don’t go adding your salty tears to the rising waters! Just like we always do, you’ll get one last seven-day shot at grabbing the Print-PDF Bundle. We also have the Megabundle, with the printed book, the PDF, and the custom 50 Fathoms Bennies. Act fast, because both of those bundles will be sailing off into the sunset before the next Tuesday comes. You can also check out the 50 Fathoms PDFs in our own Pinnacle PDF Store. Beasts & Barbarians—Soon with More Beasts! 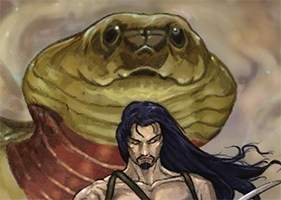 GRAmel is expanding its Beasts & Barbarians sword-and-sorcery Savage Worlds setting with your help. Check out their Indiegogo campaign for Beasts of the Dominions to see what they’ve got in mind and how you can help. As I’m writing, they’re already a third of the way home in their effort to bring more beasts, more danger, and more adventure to the Dread Sea Dominions. And, like so many of the Savage Worlds crowdsourcing efforts, this is your chance to get yourself actually written into their materials! 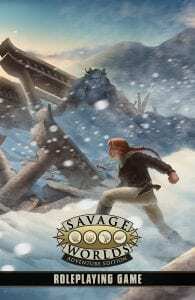 Calling All Savage Worlds Licensees! You may’ve noticed that we’ve made some changes around here lately. One thing we’re want to do is more effectively spotlight our licensees. To that end, if you’re an approved Savage Worlds licensee, make sure that you’ve sent us your logo for use on the Licensee Listings. Also make sure that you’ve signed up for the Licensee mailing list. You take care of both of those—and any other licensing-related questions—by e-mailing us at PEGlicensing@gmail.com. 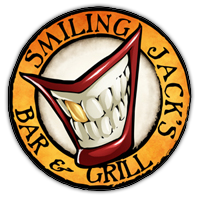 They say it’s the second longest episode of Smiling Jack’s Bar and Grill of all time, that there were great rules discussions about the Games Without Miniatures section from Savage Worlds Deluxe, and that Justin’s going to test out Hero Lab and let us know how it goes. They say there were not one, not two, but three examples of the Interludes rules dispersed throughout the show, that they talked about chases, dogfights, and when they work best, and that there was a lively discussion about handling rules in the middle of a game. They say the staff was joined by Rocky Mountain Savages Bill, Chris, Marc, and Paul. They also say that the moon landing was faked on a soundstage made of cheese, that Detroit is hiding a car that runs on license plates, and that nobody is actually stealing my socks. One little bar brawl goes horribly wrong, and you find yourself waiting for your own execution. But there’s still a chance to save your life. All you have to do is sneak into the castle, kill a traitor, and save the beautiful daughter of Baron Grotho. Sure, it’s going to be dangerous, but you’ll be spared and rewarded—if you manage to succeed. Refuse, and the executioner’s axe will show you no mercy. 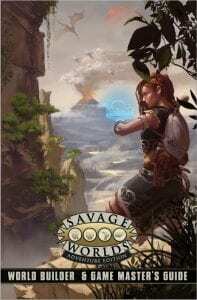 The choice is yours in Moonless Night Over Grimdell, the newest adventure for Beasts & Barbarians, GRAmel’s sword-and-sorcery Savage Worlds setting. But beware—moonless nights are always the most dangerous! It’s 1922. The World War has not ended. Apocalyptic prophecies have come true. Dozens of doctrines and ideologies promise a perfect world order with happiness for all, then coalesce into a bloody civil war that shatters the Russian Empire and, in some ways, the world itself. Behind the open conflicts, a secret war of mystic orders is playing out. The longer you survive, the more you may learn, and the more power you might yet master. But power can be as deadly to its “masters” as it is to its “victims,” and you never truly know which you are in this broken world. 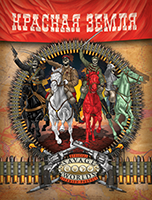 Red Land is a mystical action game in an alternate Russian Civil War in 1917–1922 where magic has become as important to politics as force and intrigue in the first Russian-language Savage Worlds setting! Red Land is brought to you by Studio 101, the fine folks producing the Russian-language Savage Worlds rules. Perhaps this is the excuse you need to add another language to your repertoire, eh? Pinnacle PDF Store Now Open! As part of the facelift of the Pinnacle Entertainment Group web site, we’re reopening the Pinnacle PDF Store. If you’re already here checking the latest in PEG News, browsing our friendly forum, or getting the latest in free downloads, you don’t have to go anywhere else to get a quick your Savage Worlds PDF fix! For those of you who are quick to fear, keep calm. 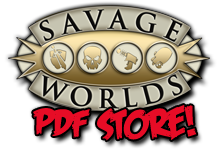 First, we’re opening up the Pinnacle PDF Store to any of our Savage Worlds licensees, so it’s not just us. Second, that doesn’t mean we’re taking any of our products down from anywhere else. If you need printed Pinnacle products, we’ll still point you to Studio 2 Publishing, our publishing partners. Our PDFs will also continue to be available from Studio 2 Publishing, RPGNow, and DriveThruRPG, as well. Heck, you can go to our partner stores straight from the Shop dropdown in the top menu bar! Have you found yourself trying to cram your shiny new Savage Worlds Deluxe rules into your Deadlands books? Well, stop it, amigo—that’s mighty rough on the bindings! Now that we’ve got that settled, how ’bout we come riding to your rescue now? 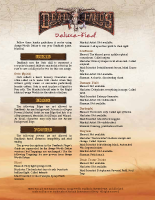 Deadlands Deluxe-ified, the brief guide to playing Deadlands with the Savage Worlds Deluxe core rules, is waitin’ on you. I can hear you back-Easters already askin’ “How much, my good man?” Well, let’s not get your ascots in a bunch, fellas. Like the preacher-man says, the best things in life are free, and who are we to gainsay the preacher-man? It’s all yours. Take one. Share it with your friends and neighbors, if you got any left. Maybe, just maybe, with the complete details on integratin’ changes to skills, Edges, and powers, you’ll have a better chance o’ survival. Good luck!